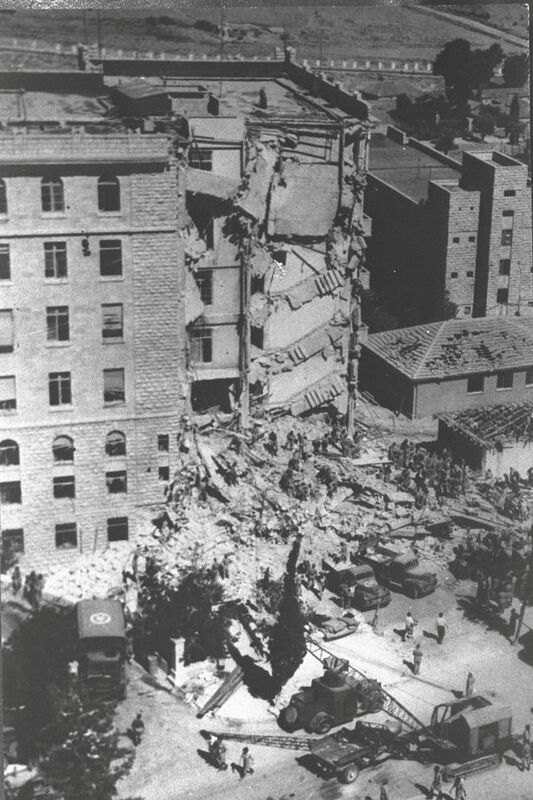 As a result of the explosion on July 22, 1946 in the southern wing of the King David Hotel, the section that since 1939 had housed various government and army offices (only in the northern wing were there tourists and other civilians who were not targeted and not harmed), over 90 persons were killed, the majority of them employees or members of the Mandate government. Despite the fact that the Irgun had not intended that anyone would be physically harmed and had made efforts to assure that warnings would be made, indirectly (releasing the kitchen staff; igniting a firewall in St. Julian's Way (today, King David Street); and tossing petards) and directly (phone calls to the hotel and police, as well as to the French Consulate), and despite Menachem Begin expressing regrets at the loss of life, the Irgun and Begin are vilified and castigated until this day. The left-wing in Israel, and the Jewish people, never stop pointing an accusatory and damming finger. On November 25, 1940, an installation in Palestine was attacked by a Jewish underground militia. The result of the explosion caused the deaths of almost 300 civilians with only 209 bodies recovered. Are the perpetrators damned in the history books? Is their deed recalled every year like with the King David Hotel? Probably the fact that those who carried out the operation were members of the Hagana. was carrying about 1,800 Jewish refugees from Nazi-occupied Europe whom the British authorities were deporting from Mandatory Palestine to Mauritius because they lacked entry permits. 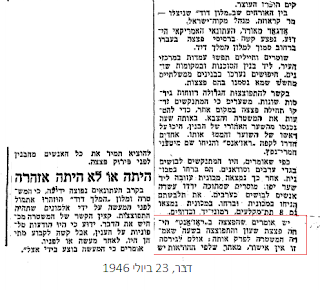 Zionist organizations opposed the deportation, and the underground paramilitary Haganah group planted a bomb intended to disable the ship to prevent it from leaving Haifa. The Haganah claims to have miscalculated the effects of the explosion. A bitter debate over the correctness of the operation raged in secret within the Zionist leadership...An effort was made to enshrine the incident as an icon of Zionist determination...Some leaders of the Yishuv (the Jewish community in Palestine) argued that the loss of life had not been in vain, as Patria's survivors had been allowed to stay in the country. Others declared that the Haganah had had no right to risk the lives of the immigrants...The Haganah's role was not publicly revealed and a story was put out that the deportees, out of despair, had sunk the ship themselves...Britain believed the Irgun was probably responsible. Hypocrisy of the left vs. the right in Zionism? But now, I'll ask them a few questions before I get back to responding to their sheet. After all, fair is fair. First, some general ones. This "occupation" to which you keep referring, would that be the occupation by Arabs of the territory of the Jewish national home by any chance? You do know that Arabs conquered and occupied the Land of Israel in 638CE, yes? The Arabs who engaged in an ethnic cleansing operation between 1920-1948, expelling the Jews that survived the pogroms and murderous riots in Hebron, Gaza, Shchem (aka Nablus), Gush Etzion, Jerusalem's Old City, Neveh Yaakov, Atarot, Nahlat Shimon, Shimon HaTzaddik, Shiloach and other areas? Arabs who called themselves Southern Syrians, not "Palestinians", into the 1920s and later and also demanded the Mandate be united with a Greater Syria? Whose leaders aligned with Hitler in WW II? Who refused a territorial compromise suggested by the Peel Commission in 1937 (not to mention that of 1922 which separated Transjordan from the Jewish National Home) and again in 1947, that of the UN Partition? 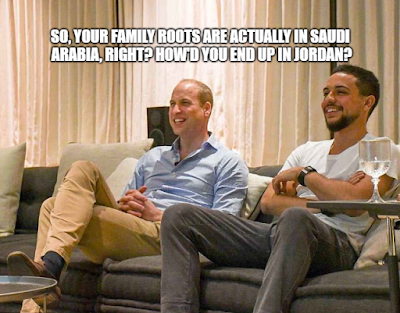 The same Arabs who went to war to eradicate the state of Israel? Who founded the PLO in 1964, three years before the Six Days War and prior to any "settlement" being constructed? Why would retreating from territory work? Did it as a result of the 2005 Disengagement from Gaza? I see you do not want to "allow [y]ourselves to be manipulated by right-wing donors". Do you not realize that you are being both manipulative of Jewish youth and being manipulated by Israel's enemies? Or do you not care? You call Israeli army’s use of violence against Palestinian protesters in Gaza as "unconscionable". Why? Have you protested incendiary kites yet? 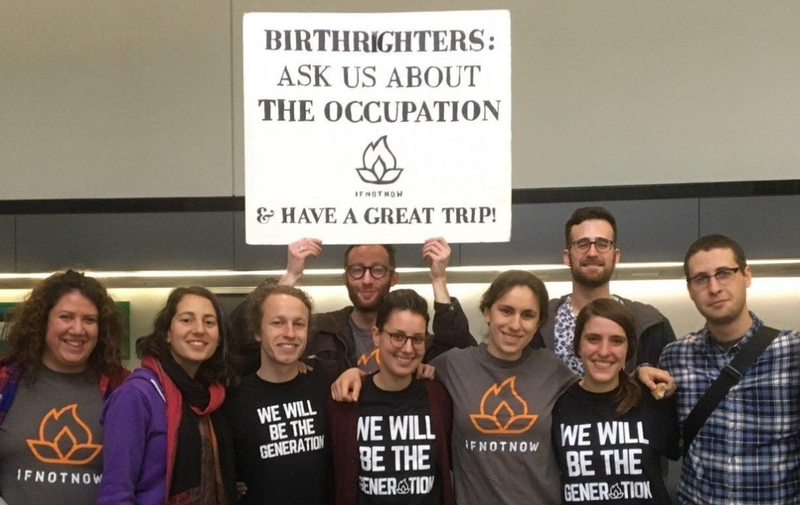 You demand "a chance at seeing the full picture" on Birthright tours. Can I join one of yours and get a chance to have the real full picture seen? And by the way, do you really think saying Kaddish for Hamas terrorists was a good idea? 1. 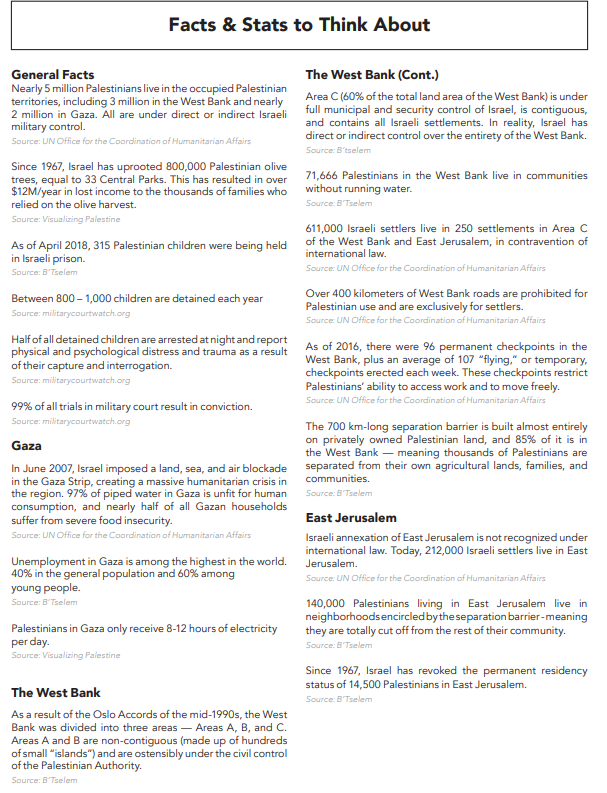 You claim 3 million Arabs are in the West Bank and nearly 2 million in Gaza. All are under direct or indirect Israeli military control. That's not at all factual. There are perhaps 2-2.2 million in Judea and Samaria. And Israeli's "indirect control of Gaza seems not to be able to prevent terror tunnels being built or rockets and mortars being fired. Maybe there should be more control? And if you are intimating a demographic problem, rest assure, Jews are already some 20% of the total population in that territory. 2. Israel has uprooted 800,000 Palestinian olive trees you claim as a fact. That is just a number thrown into the wind. In cases I have investigated, the police have indicated wildly exaggerated claims, by 100% at times, are made. And by the way, you sources are quite unreliable in most cases. 3. 315 Palestinian children were being held in Israeli prison you write? Did they perhaps commit a crime? How old are those "children"? Those children report physical and psychological distress you assert. Are those reports true? 4. 99% of all trials in military court result in conviction. And what does that imply? That Israel only arrests the guilty? 5. Palestinians in Gaza only receive 8-12 hours of electricity per day and whose fault is that? Perhaps Abbas? Perhaps Hamas? 6. 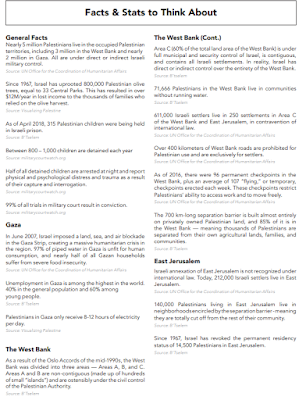 Next is "250 settlements in Area C of the West Bank and East Jerusalem, in contravention of international law." Maybe 150 communities actually. And quite not in contravention of international law. 7. And as for "Over 400 kilometers of West Bank roads are prohibited for Palestinian use and are exclusively for settlers". The only reason there is any prohibition, and most usually for fairly short periods, is the security situation, aka Arab terror. How many kilometers of roads are prohibited to Jews? And how come there is a claim of "apartheid roads" when Jews keep getting shot in drive-by shootings? Isn't that a contradiction of terms? 9. "212,000 Israeli settlers live in East Jerusalem"? Except for the 19 years of illegal Jordanian occupation and the annexation of Jerusalem's eastern area 1948-1967, the city was never divided for over three thousand years. I didn't touch on every claim but I think my message is clear: you really have no idea of what you are talking or promoting. You people are the real danger to the Jewish community ion the United States. Remember my revenant post of 14 years ago (already?)? ...why I think the word "revenant" should be used instead of "settler". a revenant is one who returns after a lengthy absence. A revenant can be any person who shows up after a long absence such as those who come back to their ancestral home after years of political exile. This is the classic definition although Sir Walter Scott used it in his novel the Fair Maid, to denote a ghost. It stems from the French "revenir," which means simply "to return". That 'ghost' connection disturbed some and others took advantage of it as if it made my term irrelevant. Of course, that was before the Oscar Awards and Leo DiCaprio's performance. But there actually is a 'ghost' in classic Zionist thinking. With the loss of their fatherland, the Jewish people lost their independence, and fell into a decay which is not compatible with existence as a whole vital organism. The state, was crushed before the eyes of the nations. But after the Jewish people had yielded up their existence as an actual state, as a political entity, they could nevertheless not submit to total destruction — they did not cease to exist spiritually as a nation. The world saw in this people the uncanny form of one of the dead walking among the living. The ghostlike apparition of a people without unity or organization, without land or other bond of union, no longer alive, and yet moving about among the living, — this eerie form scarcely paralleled in history, unlike anything that preceded or followed it, could not fail to make a strange, peculiar impression upon the imagination of the nations. And if the fear of ghosts is something inborn, and has a certain justification in the psychic life of humanity, what wonder that it asserted itself powerfully at the sight of this dead and yet living-nation ? Fear of the Jewish ghost has been handed down and strengthened for generations and centuries. It led to a prejudice which, in its turn, in connection with other forces to be discussed later, paved the way for Judeophobia. ...Judeophobia is a form of demonopathy, with the distinction that the Jewish ghost has become known to the whole race of mankind not merely to certain races, and that it is not disembodied, like other ghosts, but is a being of flesh and blood, and suffers the most excruciating pain from the wounds inflicted upon it by the fearful mob who imagine it threatens them. Judeophobia is a psychic aberration. As a psychic aberration it is hereditary, and as a disease transmitted for two thousand years it is incurable. It is the fear of ghosts; which, as the mother of Judeophobia, has evoked that abstract, I might say Platonic hatred, thanks to which the whole Jewish nation is wont to be held responsible for the real or supposed misdeeds of its individual members, and to be libelled in so many ways, to be buffeted about so disgracefully. So, I'm still using the term revenant. Can I Put 'Shiloh' and 'Occupants' Together? The Daily Mirror took advantage of Britain's Prince William's stay at the King David Hotel to cover the Irgun operation in 1946 when the southern wing was severely damaged and nearly 100 persons were killed. highlights the paper's correspondent in Mandate Palestine at the time, Barbara Broad, who was at the entrance of the hotel when the blast occurred. First of all, what was targeted was the southern wing, not the entire hotel. The northern wing was the "civilian" section where tourists stayed and was not harmed. In constantly writing "the King David Hotel", the reader receives the impression that the entire hotel was intended to be damaged. The entire southern wing of the hotel – all seven floors – was totally destroyed. obviously show that the main damage, while considerate, for sure, was to the front section of the wing and that the eastern part, to the rear, remained standing. Moreover, only a careful reader would catch reading the story that the southern wing also housed the HQ of the British Army in the country, quite a legitimate military target. the diabolical thoroughness with which Jewish terrorists planned this brutal and bloody attack was made clear to me by a senior Air Force and Army officer. 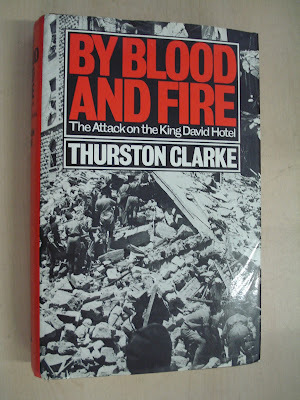 Half an hour before the main explosion, a jeep, full of Jewish terrorists armed with tommy guns, drove up the curving entrance way to the King David Hotel, the right wing of which houses the Secretariat, with British Military HQ on the top floor. One lone shot rang out as they penetrated past the ring of sentries. There was a pause and then a volley of machine gun fire. A few moments later a diversionary mine was exploded on tire pavement opposite the Secretariat, and a warning was rushed to headquarters that all troops, ATS and officers must move up to the top of the building. The warning was in time for most of headquarters staff, but the Secretariat employees rushed to the windows to see the military and police activity in the street below. The terrorists had reckoned on this, for at that moment the main explosion took place while they made off in a taxi. No jeep drove up to the entrance. There was no exchange of fire. 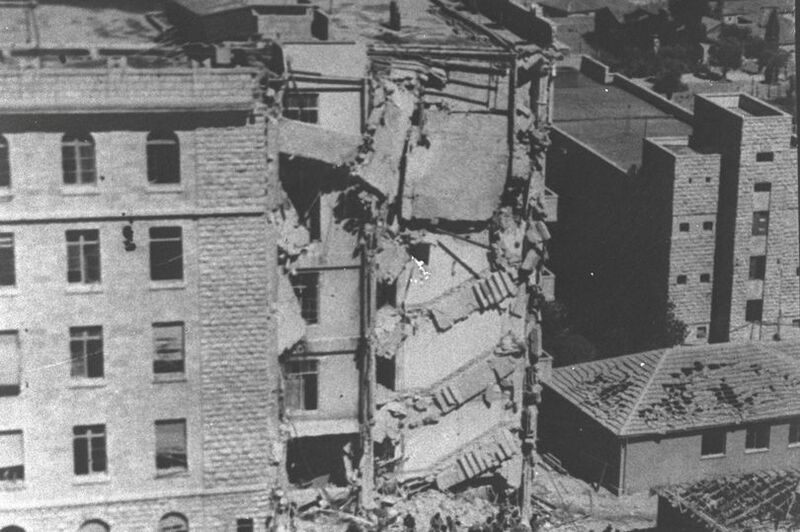 Some 25 minutes before the explosion (more about this 25 minutes below), the Irgun fighters retreated from the basement after placing the explosives around the central pillar of the Cafe Régence. Spotted by the paras on the roof (the building then was only five stories high), having been alerted by a telephone operator in the basement, they were fired on. One Irgunist eventually bled to death in an Old City hideout overnight.. The entrance to the hotel was facilitated by the adoption of a disguise in that the penetration team dressed as Arab porters who were to deliver the daily dairy supplies of milk, cheese, cream and labaniya. No frontal assault was conducted. For reasons that have never been clarified, the staff of the government secretariat and military command remained in their rooms despite the warning calls. Whose fault and responsibility was that? The Irgun's? Or the British? The French staff at their Consulate just down the road did open their windows. Shaw always denied receiving a warning. One last point in that connection: that 25 minutes vs. the planned 30, actually 45, minutes. On page 179, referencing documents HHA 1049/112 (42) and (43) and (52) in the Hagana Archives, one discovers that a bomb-disposal unit had been alerted (!) and sent to the hotel. The Davar newspaper reported this openly the day following the explosion. On p. 176, the Irgunist who fixed the timing mechanism, which had been set for 45 minutes and not 30, intimates that someone had attempted to defuse the explosives. Given that he had set a mercury initiator anti-defusing device to prevent just such an attempt, the fact that the bombs ignited prematurely meant to him that (a) the British knew the bombs where in the building; (b) where they were; (c) what potential damage existed; and (d) that they gave no proper advance order to orderly evacuate. Moreover, the fact that the British had an agent in the Irgun, who just happened to be second-in-command, is the real story here. Expecting to be forewarned by him, they perhaps were semi-hesitant when no message came through from him. One last point: the operation was granted preliminary approval by the joint X Committee of the United Resistance Movement on May 15 that year and the go-ahead operational order was issued to Menachem Begin on July 1 by Moshe Sneh, Head of the Hagana Command and Yitzhak Sadeh, operations officer of the Palmach, approved the plans. The mirror need be held up to the British officials and officers in the hotel at the time. Thanks to MP for alerting me. 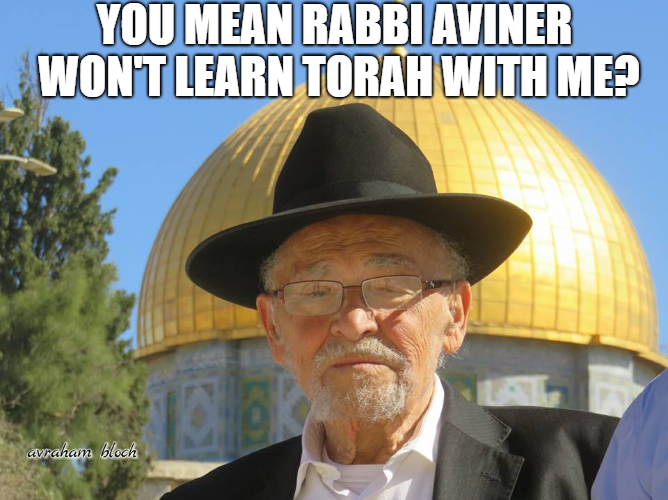 Would Rav Aviner Learn Torah With Rabbi Moshe Tendler? 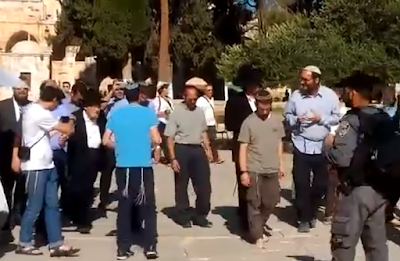 Rabbi Dr. Moshe David Tendler, a huge Torah scholar giant, 92-years old, son-in-law of Rav Moshe Feinstein who the foremost decisor of Halacha in the previous generation, ascends the Temple Mount. "יש לי חבר עם מידות טובות ותלמיד חכם, אבל הוא עולה להר הבית. האם מותר לי ללמוד איתו בחברותא?". על כך השיב הרב אבינר באופן נחרץ: "לא". לאחר מכן הוא פירט והוסיף כי "ודאי שאפשר להיות חברו וגם לקיים איתו מצוות, אבל אין ללמוד איתו בחברותא". 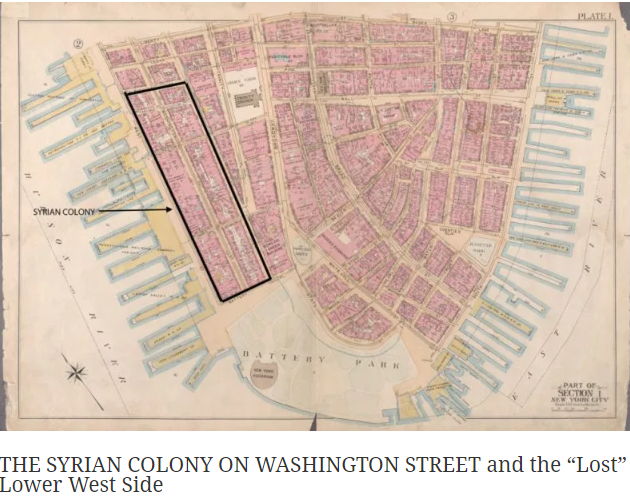 Syrians arrived in 1880 [and....settled mainly on the east side of Washington Street between the Battery and Albany. 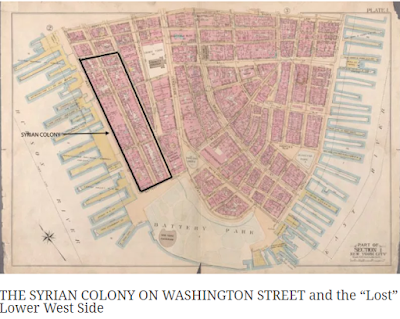 The first Syrians arrived in New York in 1878. 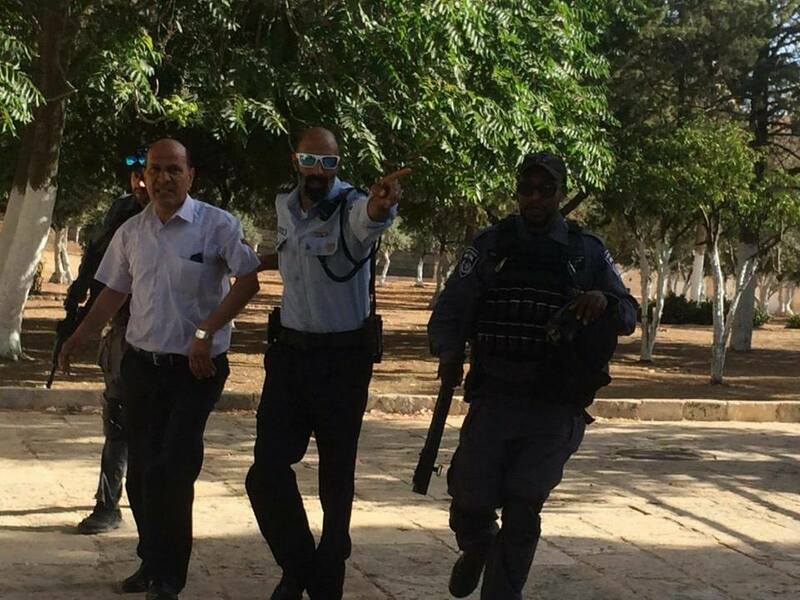 Follow-Up on "A Prince and the Tale of 'Palestine'"
The Jerusalem International Foundation on Thursday denounced the expulsion by Sheikh Azzam al-Khatib, the director-general of the Jerusalem Waqf, of the guardians of the Al-Aqsa Mosque, asking whether Jordan's position had changed. This came in a statement by the International Foundation, in response to the expulsion by Khatib of a number of guards of the Al-Aqsa Mosque from the western stairway to the Dome of the Rock, today. 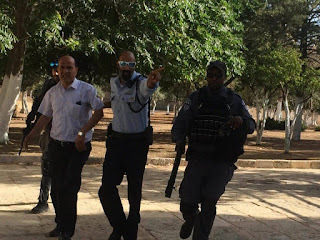 She said: "We look suspiciously to the participation of Khatib in the scheme of emptying the maximum of his guards, which leads to leaving the mosque a hotbed of settler raids." 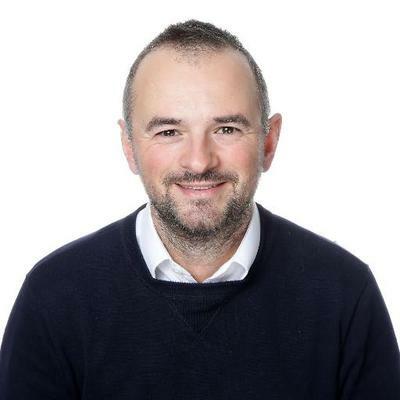 The Foundation expressed its fear that the step of the Director of Awqaf of Jordan "the beginning of the decline of the Jordanian official position in front of pressure to pass the so-called deal century. "...In March 2013, King Abdullah of Jordan and Palestinian President Mahmoud Abbas signed an agreement giving Jordan the right to "guardianship and defense of Jerusalem and holy sites" in Palestine, including the occupied city of Jerusalem. 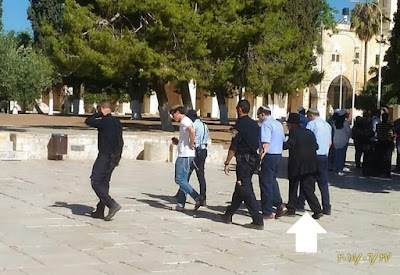 The Islamic Waqf and Al Aqsa Mosque Department warned of the blatant attacks by a group of ultra-Jewish extremists against the guards of Al-Aqsa Mosque while performing their duties in the mosque's yards. 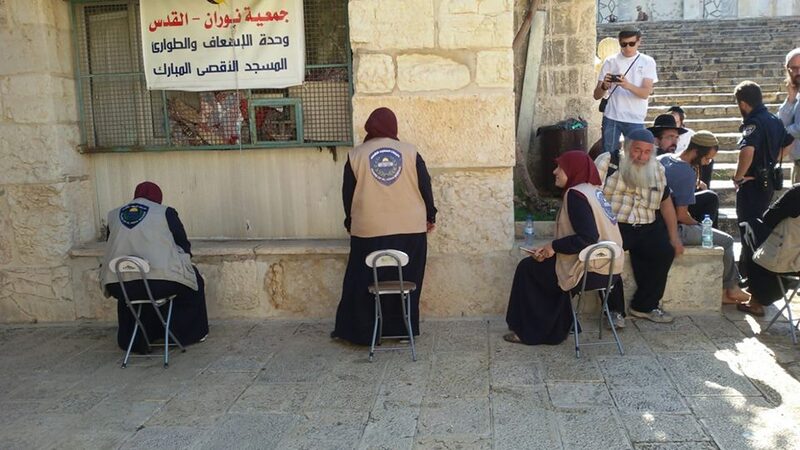 and some media carried out by the Director General of the Jerusalem Endowments Sheikh Azzam al-Khatib to keep the female guards safe and not to allow the police and extremists to harass them and arrest them. 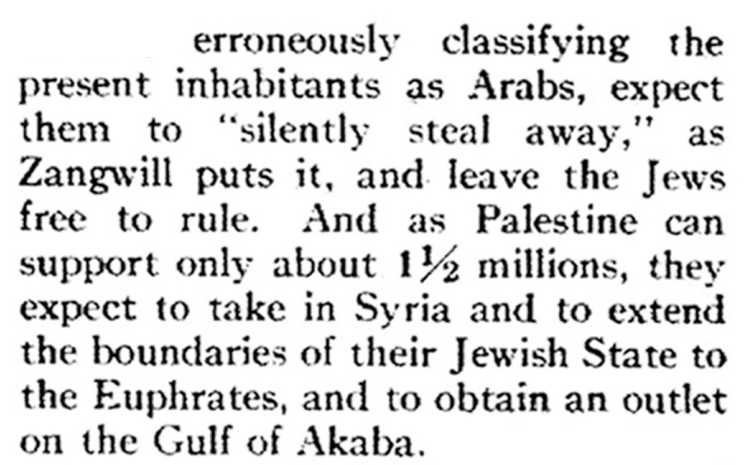 The Oddity of Being Anti-Zionist is Becoming Anti-"Palestinian"
Just under 100 years ago, Albert T. Clay, professor of Assyriology and Babylonian Literature at Yale University, published an article in The Atlantic Monthly in its February 1921 issue. this scheme for a Jewish state not only accentuates and increases the animosities that have always existed, but invites another tragic chapter in the history of the Hebrews." three aspects of Zionism, namely, the religious, economic, and political aspects. Religious Zionism is an expression used to represent the belief of orthodox Judaism that the Jews are the chosen people of the one and only God; that a Messiah will be sent to redeem Israel; and that Jehovah will gather his people, restore the Temple and its service, and reestablish the priesthood and the Jewish kingdom...Economic Zionism, so-called, has as its object the amelioration of the deplorable conditions in which Jews have lived in certain lands, where they have been outrageously persecuted...Political Zionism...claimed that the establishment of a Jewish commonwealth would become an active force, by bringing diplomatic pressure to bear upon the nations, to secure protection for Jews in all lands. A clannish sense of pride in the Jewish race, however, seems to be uppermost in their minds. They apparently think that their status in society will be enhanced everywhere if a Jewish nation exists in Palestine. This phase of Zionism is the crux of the whole Palestine problem. foist upon the intelligent public the idea that the population of this land is made up of Bedouins, or even of Arabs, is a deliberate attempt to deceive it. The inhabitants of the land should be called Syrians — or Palestinians, if Palestine is to be separated from Syria. True, there are many Arabs living there, more, for example, than Greeks, Germans, or Latins, because of the proximity of Arabia; but these are not the real Palestinians, nor do they represent the bulk of the substantial part of the nation...There can be no question that the blood of the present Palestinian, or Syrian, includes that of the Jew as well as of the Amorite, Hittite, Phoenician, Philistine, Persian, Greek, Latin, and Arab. Such a fusion is not unlike that found in the veins of many Americans whose ancestors have lived here for several generations. When the whole population of Palestine became Mohammedan, there is little doubt that a large percentage of the Jews were also forced to accept this faith; their descendants are now classed by the Political Zionists as ‘Arabs.’...it is a deliberate misrepresentation to classify the inhabitants as ‘Arabs.’... if we are to decide the question of actual ownership of the territory, the Palestinian who has continuously lived there surely has a clearer title than the Jew. 1. The independence of Syria, from the Taurus Mountains to Rafeh, the frontier of Egypt.2. Palestine not to be separated from Syria, but to form one whole country.3. Jewish immigration to be restricted. The entire Christian and Moslem population agreed to these resolutions. It should be said here that there is no justification, from an ethnological or geographical point of view, for dividing Syria into the northern part under the French and a southern part, namely Palestine, under the British. This has already been pointed out by the greatest authority on the history and geography of Palestine, Sir George Adam Smith. One race, the Syrian, or Palestinian, is dominant throughout the territory, from Aleppo to Beersheba; and there is no natural frontier that can divide the two halves of this land...The question arises then, why should the land and people be separated, and two separate administrations be established, with all the expense that this implies? For the entire territory, from Aleppo to Beersheba, is only about 400 miles long and 100 miles wide — about the length of Pennsylvania, and one third its width? Why divide this small land and its people? There is no real "Palestine" and if it weren't for Zionism, we would never have heard of such a country or a nationality. Way back in 2009, the American-Arab Anti-Discrimination Committee announced in a news release that it had filed “multiple administrative complaints” with the Treasury Department and the Internal Revenue Service requesting investigations into the activities of tax-exempt groups raising money for West Bank settlements and I covered that. As I did David Ignatius' piece. The New York Times pursued it a year later. The issue has not left us. So I have collected material that deals with the issue as far as the claim that somehow monies donated for charitable purposes are illegal or even war crimes. 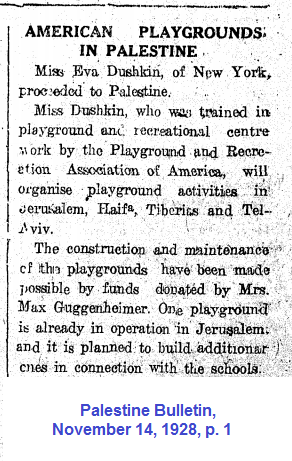 Jewish communities abroad have, since Talmudic times, have donated charity to Jews residing in the Land of Israel (Eretz-Yisrael) to support the Jews residing in the national homeland, to provide support for individual Jews, institutions of various kinds such as schools, soup kitchens and societies of mutual aid as well as purchasing land for construction of homes, establishing industries and planting of agriculture products. In particular, beginning in the mid-18th century, American Jews were a source of these funds even as many scores of emissaries from Eretz-Yisrael traveled to many hundreds of Diaspora communities on six continents. First of all, Judea and Samaria, falsely portrayed as a separate geographical region of Arab national identity and named the "West Bank", were actually the heart of Jewish geographical activity. Eretz Yisrael, the Land of Israel (Hebrew: אֶרֶץ יִשְׂרָאֵל,) is the historic name for the area in the Southern Levant, or Canaan, between Syria and Egypt which had various geographical identities. The definitions of the limits of this territory vary according to several passages in the Bible including Genesis 15, Exodus 23, Numbers 34 and in Ezekiel 47, 1 Kings 8:65, 1 Chronicles 13:5 and 2 Chronicles 7:8 the borders are given as "from the entrance of Hamath unto the brook of Egypt”. 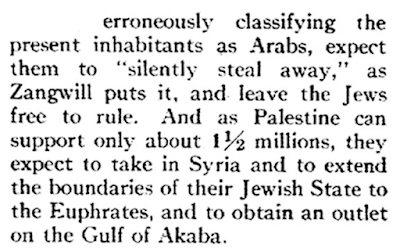 On 13 September 1919, a memorandum was handed from Lloyd George to Georges Clemenceau which stated that British Palestine, employing Biblical geography, would be "defined in accordance with its ancient boundaries of Dan to Beersheba". This identification of the territory with the land described in the Bible and other ancient texts, and it need be stressed that the overwhelmingly place-names mentioned in the Bible are actually located in Judea and Samaria, is not an imagined identity or a myth. Ever since the American archaeologist, Edward Robinson, Professor of Sacred Literature at Andover Theological Seminary and the founder of Biblical archaeology, traveled to Palestine in 1838 and made many dozens of identifications of ancient places referred to the Bible, literally thousands of Biblical sites have been verified, most of them in Judea and Samaria. Most famous include Beth-El, Hebron, Shiloh, the Altar on Mount Ebal, Shomron/Samaria, Hebron’s Cave of the Patriarchs, Tel Shchem, Jericho as well as locations mention in the New Testament, the Books of the Maccabees and Second Temple literature, both Jewish and Roman. As an example, Khirbet Qeiyafa, south-west of Jerusalem, which archaeologists believe could be the biblical city of Sha'arayim, meaning 'Two Gates', mentioned in the story of the battle of David and the Philistine giant, Goliath, represents possibly the earliest physical evidence of a Davidic city dating back to the 11th Century BCE. The clue included two inscriptions written in the Canaanite script that were found on a jar and a pottery fragment which are believed to be the earliest known example of Hebrew writing. The General Assembly, Having met in special session at the request of the mandatory Power to constitute and instruct a Special Committee to prepare for the consideration of the question of the future Government of Palestine at the second regular session;…Requests that The Security Council take the necessary measures as provided for in the plan for its implementation… The Mandate for Palestine shall terminate as soon as possible but in any case not later than 1 August 1948…Independent Arab and Jewish States and the Special International Regime for the City of Jerusalem, set forth in Part III of this Plan, shall come into existence in Palestine”. In fact, the concept of a “Palestinian citizenship” was first formalized in Article 7 of that decision: “The Administration of Palestine shall be responsible for enacting a nationality law. 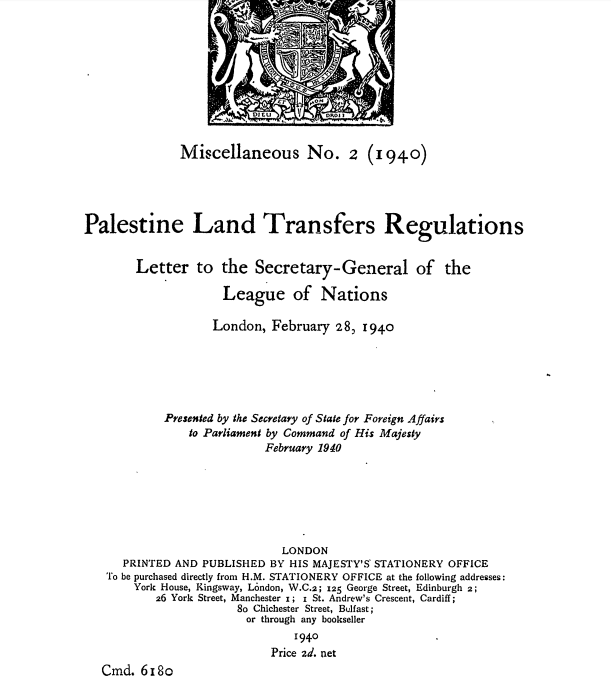 There shall be included in this law provisions framed so as to facilitate the acquisition of Palestinian citizenship by Jews who take up their permanent residence in Palestine.” Again, it is clear that the country, which until 1947 encompassed all the area now known as Israel and Judea & Samaria (or the ‘West Bank’) was intended to provide Jews which a political primacy. In the territory of what is historical Eretz-Yisrael/Land of Israel, where the Jews established a political entity, first under a rule of Judges for some three centuries, and then two separate Monarchies, interrupted by a short 70-year period of forced exile, and then a Commonwealth rule under the Hasmonean Family until 135 CE, no distinct “Palestinian Arab” state ever existed. In fact, Arabs only conquered the territory in 638 CE. They lost their control to the Crusaders and Muslim rule only returned at the end of the 13th century. 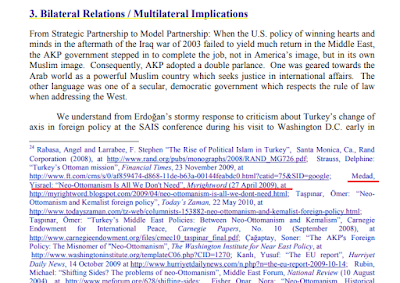 Administratively, under the Ottoman Empire rule, whose seat of power was in Constantinople, the country was always divided up into several units but never one country. Moreover, the very name “Palestine” was a Roman invention after the end of the Bar Kochba Revolt in 135 CE. Under Ottoman rule (1517-1917) there was no political entity actually known as Palestine but a term preserved by the Christian world referring to the “Holy Land” or “Judea”. The name taken from the Hebrew word Pleshet was used by Emperor Hadrian in an attempt to eradicate any trace of Judaism in the land. By the 425, the Byzantine heirs to the eastern part of the Roman Empire delineated three provinces: Palaestina Prima, which included the coastal towns, the Judean Hills and the Jewish section of the Jordan Rift; Palaestina Secunda, which comprised the Jezreel Valley, the Galilee, and the Golan; and Palaestina Tertia, which consisted of the Negev, Ammon, Moab and Edom. After the Arab conquest in 638, Palaestina Prima was named Jund Filistin. Under the Mamluke (1267-1517) and Ottoman rule, the use of the term Filistin was not resumed. The term “West Bank” was coined in April 1950 when the Hashemite Kingdom set up by the British in TransJordan “annexed”, as it were, the regions of Judea and Samaria, as they were termed in the 1947 United Nations’ Partition Plan. That act was never recognized by any of the world’s countries except Great Britain. The so-called “Green Line” was never a recognized legal political border but rather an armistice line which resulted from a ceasefire in 1949 which was never intended to become permanent. Throughout the centuries of the loss by the Jews of their capability to exert normative political rule Jews resided in areas which are now termed “Palestinian territories”. One of the first detailed and thought out plans in the late Ottoman period was that of George Gawler, a Christian, which was published in London in 1845. He sought to purchase waste lands in the areas of Haifa, Acre, Jaffa as well as Sidon and Tyre. A Jew, Rabbi Avraham Solomon Tzoref, wasmurdered shortly after buying property in Jerusalem’s Old City in 1854. Land near the village of El-Midieh, at the site of ancient Modi’in, where the Hasmonean Revolt broke out in 164 BCE, purchased in 1882 by the American Christian brothers, Herbert and Frank Clark, originally from Maine but who has settled in the country, was the focus of attempts by English Jews who sought to buy it from as they themselves were prohibited from doing so as foreigners. In today’s terms, that land is over the former Green Line armistice boundary. (See: Ruth Kark, ed., Redemption of the Land of Eretz-Israel, Yad Ben-Zvi, 1990). During the British Mandate regime, Jewish communities in Hebron, Gaza, Shchem (Nablus), Old Jerusalem and more modern communities such as Atarot, Neveh Yaakov, Bet HaAravah and the four kibbutzim in the Etzion Bloc south of Jerusalem were violently attacked in a series of murderous riots and pogroms in 1920, 1921, 1929 and 1936-1939 culminating in the Arab war of aggression launched on the morrow of the UN Partition recommendation acceptance on November 19, 1947. All this violence resulted not only in property damaged and lives lost but the thousands of Jews residing in these areas were forced to flee, becoming refugees. An operation of ethnic cleansing took place and was finalized by the 19-year illegitimate Jordanian occupation when no Jew was permitted to live in those areas. Jews resided in the area now known as the "West Bank and Gaza" or "Judea, Samaria and Gaza", that is, the territories of the original Mandate area which were occupied following the 1948-49 war by Egypt and Jordan for many centuries. In fact, the 19-years between Israel's War of Independence and the 1967 Six Days War was one of the very few periods that Jews were prohibited from living in those area since the end of the Crusader era. In Hebron, a Jewish community reaching back into Biblical times was ended in 1929 after murderous Arab riots. Only one Jewish family was in the town in 1947. 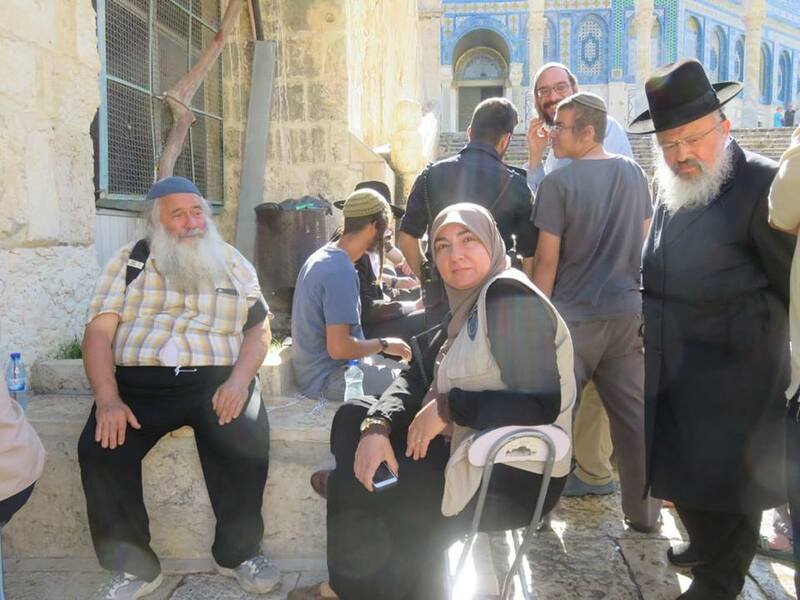 “On Sunday, 9 Marheshvan (17 October), I left Jerusalem for Hebron to kiss the tombs of my ancestors in the Cave. On that day, I stood in the cave and prayed, praise be to God, (in gratitude) for everything”. In 1170, Benjamin of Tudela visited the city. In 1244, the Memluk Sultan Baibars forbid Christians and Jews from entering the Cave of the Patriarchs, a decree that lasted until 1967. Hebron was visited by Nachmanides (1270) and Ishtori HaParchi (1322) who noted the old Jewish cemetery there. The Italian traveller, Meshulam of Volterra (1481) found not more that twenty Jewish families living in Hebron. The expulsions of Jews from the Iberia Peninsula in the 15th and 16th centuries resulted in Sephardi Jews moving into the Holy Land took place. The Jewish community fluctuated between 8-10 families throughout the 16th century, and suffered from severe financial straits in the first half of the century. In 1540, the kabbalist Malkiel Ashkenazi established the Sephardi Abraham Avinu Synagogue, which, having been virtually destroyed under Jordanian rule, was reconstructed. In 1659, Abraham Pereyra of Amsterdam founded the Hesed Le'Abraham yeshiva in Hebron which attracted many students. During the Peasant Arab revolt of 1834, Jews were attacked with murders and rapes occurring amongst the Jewish population. By 1850, the Jewish population consisted of 45-60 Sephardi families, and of 50 families, followers of the Lubavitch Hasidic movement who established their community in 1823. In the fourth century Gaza was the primary Jewish port of Israel for international trade and commerce. Notable medieval rabbis such as Rabbi Yisrael Najara, author of Kah Ribon Olam, the popular Shabbat song, and renowned Kabbalist Rabbi Avraham Azoulai, served in Gaza Jewish communities. The founding of the Sabbatean movement took place in Gaza in 1665 when the self-anointed "prophet", Nathan of Gaza, declared Shabtai Zvi top be the Messiah in Gaza. The periodic removal of Jews from Gaza goes back at least to the Romans in 61 CE, followed much later by the Crusaders, Napoleon, the Ottoman Turks, the British and the contemporary Egyptians. However, Jews exhibited resilience and continued to live in Gaza throughout the centuries, with a stronger presence in the nineteenth and early twentieth centuries. Jews were present in Gaza until 1929, when they were forced to leave the area due to violent riots against them by the Arabs. Following these riots, and the death of nearly 135 Jews in all, the British prohibited Jews from living in Gaza to quell tension and appease the Arabs. Some Jews returned, however, and, in 1946, kibbutz Kfar Darom was established to prevent the British from separating the Negev from the Jewish state. It was eventually overrun in the 1948 war. A corruption of the Latin, Neapolis, Nablus is situated on the remains of the Biblical town of Shchem. Records of Muslim courts attest to the presence of Jews in the city throughout various Muslim rulers, including the Samaritans who managed to continue to live in the town under the Jordanian occupation. In his visit there in 1170, Benjamin of Tudela found a large Samartian community. In 1552, there were 12 families there and the census counts of the late 16th century reported between 36 and 71 families. A Sabbatean community established itself there in the late 17th century. There was a synagogue in the city in 1773 and in The 1839 census conducted by Sir Moses Montefiore recorded 25 families, and 12 families were found there in the 1865 census. In 1895, 120 Jews were living in Shchem but that numbered dropped to 50 within a year and when Yitzhak Ben-Tzvi visited in 1908, he found no Jews. The next year, 1909, a Jew settled in the ton and opened a hotel but due to Arab persecution was forced to leave. The British Census of 1922 registered 7 Jews living in Jenin and only 4 in 1931. As a result of the renascent Jewish national movement, new agricultural communities were founded. Among them was Atarot, founded in 1919, and Neveh Yaakov, established in 1924, both north of Jerusalem; four kibbutzim - Kfar Etzion (1935), Massuot Yitzhak (1945), Ein Tzurim (1945) and Revadim (1947) - in the Etzion Bloc, south of Jerusalem as well as Migdal Eder, a farming community established in 1927 but wiped out in the 1929 Arab riots; and another kibbutz, Bet Haaravah (1939) along the Dead Sea. The population of these communities became refugees after the 1948 war and until 1952 were receiving UNRWA assistance. Their population numbered almost 3000 Jews. The 1948 war also resulted in several thousands of Jews who were resident in the Jewish Quarter of Jerusalem’s Old City to flee. It should be noted that thousands more had already fled from both the Jewish as well as Muslim Quarters following Arabs riots in 1920, 1921, 1929 and the 1936-1939 Arab Disturbances period of anti-Jewish terror. 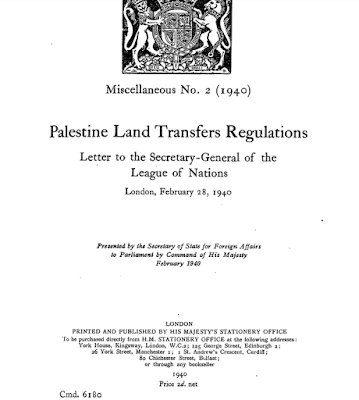 What need be taken into account in that the British prohibited land sales in Judea and Samaria throughout the Mandate period and especially after 1940. It need be recalled that it was only in 1873, when the Ottoman empire enacted the Land Emancipation Act that Jews were permitted to own property as individuals. On February 28, 1940, as a result of the new policy decided in the May 1939 White Paper, the Mandate authority published the Land Transfer Regulations which divided the country into three zones. In one, which consisted of 63% of the land area, transfers were permitted solely to Arabs whereas in the second, some 32 percent of the country, transfers from a Palestinian Arab save to another Palestinian Arab were severely restricted. In the remaining 5% land sales remained unrestricted. This law severely interfered with the ability of Jews to purchase property in the areas later to become known as Judea and Samaria. The combined factors of the new 1940 regulations, the dangerous security situation in these regions as well as the relatively infertile agricultural value of the lands there, purchases were minimal after 1936. It need be noted that land acquisitions were made in areas outside the Mandate territory of Palestine. In the mid-1890s, purchases of land in the Golan and Hawran by Zionist associations based in Romania, Bulgaria, the USA and England had begun in earnest. Earlier, in the winter of 1885, members of the Jewish community in Safed had purchased 15,000 dunams of land from the village of Ramatanya in the central Golan, 12 kilometers south of today's Kuneitra and 35 families arrived at the site. However, Ottoman bureaucratic delays in obtaining a title deed caused the project to be abandoned after a year. Later, the same group purchased 2,000 dunams of land from the village of Bir e-Shagum on the western slopes of the Golan and the village that was set up there, Bnei Yehuda, existed until 1920 and in 1944, the Bnei Yehuda lands were purchased from their Jewish owners by the JNF, but again, Jewish property ownership was thwarted in the courts. Between 1891 and 1894, Baron Edmond James de Rothschild purchased around 150,000 dunams of land in the Golan and its eastern section, the Hawran, for Jewish settlement. Legal and political permits were secured and ownership of the land was registered in late 1894. The Russian Agudat Ahim society acquired 100,000 dunams of land in several locations in the districts of Fiq and Daraa. A plant nursery was established and work began on farm buildings in Djillin. Jews also built a road stretching from Lake Hula to Muzayrib. A village called Tiferet Binyamin was established on lands purchased from Saham al-Jawlan by the Shavei Zion Association based in New York, but the project was abandoned after a year when the Turks issued an edict in 1896 evicting the 17 non-Turkish families. A later attempt to resettle the site with Syrian Jews who were Ottoman citizens also failed. Between 1904 and 1908, a group of Crimean Jews settled in the Bethsaida Valley, initially as tenants of a Kurdish proprietor with the prospects of purchasing the land, but the arrangement faltered. Jewish settlement in the region dwindled over time, due to Arab hostility, Turkish bureaucracy, disease and economic difficulties. 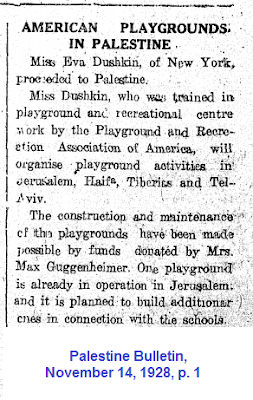 In 1921–1930, during the French Mandate, the Palestine Jewish Colonization Association (PICA) obtained the deeds to the Rothschild estate and continued to manage it, collecting rents from the Arab peasants living there. In negotiations between the British and French governments, the Golan Heights became territory under the French Mandate over Syria by 1924. Dr. Dotan Goren, of the Department of Geography and Environment at the Bar-Ilan University, has published research on Jewish purchases of land in Transjordan (see his Hebrew-language study) as has Tzvi Ilan. Due to the difficult economic situation prevailing in Transjordan in the early 1930s, the Emir Abdullah viewed with favor land purchases and encouraged the same. Two major purchases were the option granted to the Jewish Agency in 1933 to lease lands owned by the Emir Abdullah himself in the Jordan Valley between the Allenby Bridge and Wadi Zarka, some 50-70,000 dunams as well as land owned by Sheikh Mitkal Pasha al-Fayez. It the summer of 1933, negotiations began for the purchase of 17,000 acres of its land in Al-Hamra (Salt District) Transjordan. A contract was signed on January 18, 1934 but the land ownership could not be transferred. The main factor was the opposition of the British mandatory authorities. Areas that were acquired by Jews in Judea and Samaria which were not at the time settled include, for example, what is now most of the Daheisha refugee camp, the heart of the Har Choma/Har Shmuel neighborhood in south Jerusalem and an area near the community of Bet Aryeh. As regards the unique United States relationship to the renewed Jewish National Home, it need be noted that the United States, despite not being a member of the League of Nations, took the step of passing into treaty law on December 3, 1924 the Convention between the United States and Great Britain in respect to rights in Palestine. It was ratified by the Senate on February 20, 1925; ratified by President Calvin Coolidge on March 2, 1925; and finally proclaimed on December 5, 1925. Article 5 established that “United States nationals will be permitted freely to establish and maintain educational, philanthropic and religious institutions in the mandated territory” thereby recognizing the centuries old customs and practices of Jews residing in Diaspora countries of providing charity to Jews living in Eretz-Yisrael (to be described below). But this Convention had one further involvement in the question of Palestine’s territoriality status which provides insight into the status of American recognition of the areas in which Jews had the right to reside and develop. 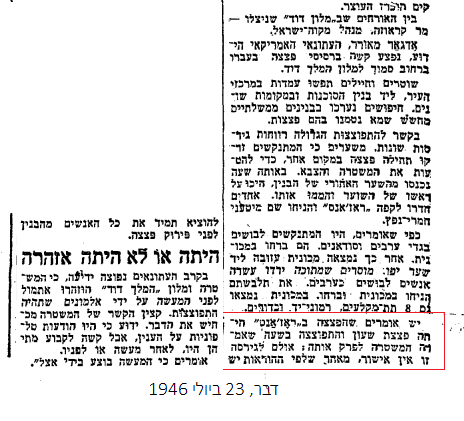 On April 24, 1946, it was reported in the press that the U.S. government was not prepared, at that times, to recognize Transjordan’s independence. Secretary of State James F. Byrnes announced that the State Department considers that "it would be premature for this Government to take any decision at the present time with respect to the question of its recognition of Transjordan as an independent state." In a letter to Senator Francis J. Myers of Pennsylvania, Byrnes points out that Article 7 of the above 1924 Convention, which stipulates against modification of the Mandate without United States assent, renders it possible for this Government to decline to recognize the validity of the application to American rights and interests, as defined by the [1924 Anglo-American] convention, of any modification of the Mandate unless such modification has been assented to by the Government of the United States." (See further the United States position regarding certain problems of United Nations organization and procedure, pp. 411-413 of “United States Department of State / Foreign relations of the United States, 1946”). Even though the Convention’s validity no longer exists, the thrust of the commitment the United States took upon itself was the principle that American values and interest were to be safeguarded to the full extent that they could. Let us now return to the beginning of the charitable support from Diaspora Jews to those residing all throughout the Land of Israel. Professors S. Safrai and M. Stern note as regard the end of the Second Temple period in their "The Jewish People in the First Century, Volume 1", that "the great Jewish Diaspora, in the Parthian and in the Roman Empires, was linked by many ties with the centre of Jewish life in the Land of Israel. These contacts had a great influence on the way of life and the organization of Jews in the Diaspora…Relations between the Diaspora and the centre in the homeland depended on a number of basic factors in Judaism, and on the political and military realities of the period…". This paradigm repeated itself throughout the years of exile. This is supported by Isaiah Gafni’s “Land, Center and Diaspora: Jewish Constructs in Late Antiquity”. In their 2008 article, Paul Rozin and Sharon Wolf of the Department of Psychology at the University of Pennsylvania speak of an attachment to national and sacred land and land as a protected value. This type of relationship exists with other groups and is not unique solely to the Jewish people even though the phenomenon of charity donated to the Jewish communities in Eretz-Yisrael is quite remarkable for its longevity, the breadth of the out-reach and the institutional administrative framework that was created and maintained by such persons as Moses Montefiore and Lord Rothschild in the more modern period or earlier, in centers based in Amsterdam, Vilna and Istanbul in the 17th and 18th centuries and in Germany already in the 14th century. "A Chinese American wakes up and logs on to China.com where she catches up on the previous day's events in China and in ethnic Chinese communities around the world.' A sari-clad woman on Long Island purchases Resurgent India Bonds over the phone, putting her savings into the service of her homeland. 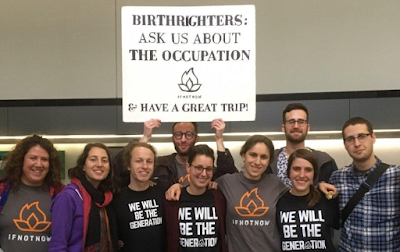 A Jewish American boards a subsidized flight, joining other Jewish Americans flying to Israel to vote in a crucial election. Taking office as President of Ireland, Mary Robinson declares her intention to represent not just the 3.5 million people residing in the Republic, but also the other seventy million worldwide who claim Irish descent. An Albanian American in Yonkers prepares to go fight in the Kosovo Liberation Army.While diasporas are as old as history, diasporas at the turn of the millennium maintain bonds to their homelands and among their members that are stronger than ever. Today, the diaspora-people dispersed from their homelands, yet maintaining ties to those homelands and to each other-votes, invests capital, participates in political life, and even takes up arms, all for a distant homeland." The volume “Eretz Israel: From the Destruction of the Second Temple to the Muslim Conquest” edited by Z. Baras, S, Safrai, Y. Tsafrir, M. Stern published by Yad Ben-Tzvi, in 1982 informs that despite the loss of political independence, the Jewish community in Eretz-Yisrael retained supremacy over the Diaspora communities in such areas of Torah allegiance and fulfilment of religious obligations by decisions of Eretz-Yisrael rabbis in matters of ritual as for example obligations dealing with the produce of the Land of Israel from which tithes or other agricultural-based commandments apply as recorded, for example, in Tractate Kiddushin 39A. The term "messenger of Zion" was applied during the Amoraic era (fourth century CE) to Rabbi Hama ben Ada, who traveled between Babylon and Eretz Israel, delivering decisions and messages, and probably soliciting relief. Eventually, the term adopted became “shadar” which translates as “emissary of the Rabbis”. Control of religious and communal life in the Diaspora was regulated in various ways such as the desire of Jews to be buried in Eretz-Yisrael, the fixing of the Hebrew calendar by the siting of the new moon in Eretz-Yisrael and even a courts system that was based in the Torah learning centers in Eretz-Yisrael. As an example, a woman could lose her marriage contract dowry if she refused to go to Eretz-Yisrael with her husband and in some cases which occurred many centuries later, a woman could gain her divorce if she wanted to emigrate to Eretz-Yisrael while her husband refused. After Second Temple destruction, wasn't until 95 CE that diaspora relations were renewed with a visit to Alexandria. Rabbi Akiba visited Babylon, Africa, Arabia and Gallia (Western Europe) in the first quarter of the 2nd century. The practice of emissaries sent abroad was initiated even before the Romans destroyed the Second Temple as testified to even by Church Fathers, Roman literature and even a grave marker in Asia Minor which noted the eulogies made by emissaries from Israel. It was halted only in 425 CE. Earlier, in the mid-4th century, after Roman rule was replace by that of the Byzantine Empire, Jews paid a tax which then was recognized by the Byzantine Emperor Julian which was to fund the rebuilding of the Temple in Jerusalem. According to "Emissaries from the Holy Land: The Sephardic Diaspora and the Practice of Pan-Judaism in the Eighteenth Century", Matthias B. Lehman, Stanford University Press, 2014, for Jews in every corner of the world, the Holy Land has always been central and a main indication was when Jewish leaders in Palestine and their allies in Istanbul sent rabbinic emissaries on global fundraising missions. 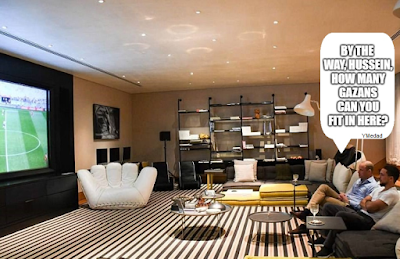 From the shores of the Mediterranean to the port cities of the Atlantic seaboard, from the Caribbean to India, these emissaries solicited donations for the impoverished of Israel's homeland. This philanthropic network raised funds and built relations of trust and solidarity across vast geographic differences. The book shows how cross-cultural encounters and competing claims for financial support involving Sephardic, Ashkenazi, and North African emissaries and communities contributed to the transformation of Jewish identity from 1720 to 1820. This solidarity among Jews and the centrality of the Holy Land in traditional Jewish society was always ever-present in Jewish communal life. For example, in 1558, a Portuguese-born marrano, Doña Gracia, was granted tax collecting rights in Tiberias and its surrounding villages by Suleiman the Magnificent. She obtained a permit to establish Jewish autonomy there. In 1561 her nephew Joseph Nasi, encouraged Jews to settle in Tiberias. Securing a firman from the Sultan, he and Joseph ben Aderet rebuilt the city walls and laid the groundwork for a textile (silk) industry, planting mulberry trees and urging craftsmen to move there. In the 1720s, Zahir al-Umar a Bedouin, fortified the town of Tiberias. Under Zahir's patronage, Jewish families were encouraged to settle in Tiberias and he invited Chaim Abulafia of Smyrna, Turkey to rebuild its Jewish community. Safed, in the hills above Tiberias, recovered from its destruction by Arabs in 1660 relatively quickly and remained an important Jewish center in the Galilee. Thus, when the Jewish National Fund passed out charity collection boxes (pushkes) it was following a centuries-old tradition. The Hebrew term “Halukah” was used to describe this system of mutual subsistence: Diaspora Jews would provide funds while those Jews living in Eretz-Yisrael would serve both as their spiritual uplifters in addition to fulfilling the commandments regarding the Jewish homeland. Halukah translates as “distribution”. Systematic Halukah began in 1600, when fairly large numbers of Jews settled in the Holy Cities of Jerusalem, Safed, Hebron, and Tiberias to pray for the coming of the Messiah. Lacking means of support, they sent messengers to raise money in the Diaspora. Sympathetic Jews in a diaspora area usually would form a standing committee collect and to remit funds. The money was usually divided amongst the various communities based on geographic origin rather than per project or need. The distributions were made semiannually, before the Passover and the New Year festivals. In 1257, R. Jehiel of Paris moved his yeshivah from France Paris to Jerusalem. The expenses for his three hundred disciples became too burdensome and so he sent R. Jacob of Paris as a representative to solicit relief funds. R. Jacob appears to have been the first emissary from Eretz-Yisrael in the medieval period. In the famine of 1441 the Jewish community of Jerusalem, probably for the first time, sent an emissary to European countries. He traveled via Constantinople, where he obtained the necessary credentials from the central committee headed by Moses Capsali. However, as Constantinople and Jerusalem were at the time under the jurisdiction of the warring states of Turkey and the Egyptian Mamelukes there was a prohibition under Turkish law from allowing money to be imported to Jerusalem. Rabbi Joseph Caro of Safed (d. 1575), author of the authoritative code of Jewish Law, the Shulkhan Arukh, ruled that residents of Jerusalem and of the Holy Land have a superior claim upon Jewish charity. Moses Hagiz, a typical emissary, highlights, in his "Sefat Emet" (Amsterdam, 1697), that due to the Holy Land being religiously superior to other countries, and that the duty of settling there even before the arrival of Messiah prior to the fulfillment of the prophecies is obligatory, the emissary is "sent abroad to acquaint our people in foreign countries of Jewish conditions in the Holy Land, and to enlist sympathy and support for the standard-bearers of the Tabernacle of God, who keep alive Jewish hopes and inspirations in the Land of Israel." He points out that the fact that "Christians will remit thousands of pounds annually for the maintenance of a Christian settlement is a challenge to the Jews who neglect to provide for the beloved sons of Zion." In Hagiz’s time, the main sources of the halukkah were in London, Amsterdam, Venice, and Leghorn (Italy). From the 1750s on, in ever-increasing numbers, adherents of the Hassidic trend from White Russia and the Western Ukraine began arriving in the Holy Land and eventually created their own Halukah organization, with the aid of the Council of the Four Lands, headquartered in Lublin, Poland. A subscription fund-raising campaign for the Halukah was introduced by Rabbi Abraham Kalisker, leader of the Hasidim in Tiberias. He secured the assistance of Rabbi Mordecai of Niesvizh, who issued a proclamation, dated 22 Adar I., 5556 [March 1796], imploring every male and female, adult and minor, whether living in cities or villages, to donate a fixed sum every week for the support of their countrymen, who had settled in the Holy Land. In 1801, about two dozen disciples of Rabbi Elijah of Vilna, led by Rabbi Menahem Mendel of Shklov and Rabbi Yisroel ben Shmuel of Shklov, emigrated from Lithuania to the Holy Land, and joined the rolls of the needy at the trough of the Halukah. In Belarus, yet another center of collection and distribution was thus established. Rabbinical emissaries were appointed to raise funds abroad for the Jewish communities of Eretz-Yisrael. They were most active between the seventeenth and nineteenth centuries but the practice goes back to Talmudic times. The formal title given to them was ‘Rabbinical Emissaries’ (Sheluḥe de-Rabbanan and in abbreviation, Shadarim). - 1441 Esrim ve-Arba‘ah: Europe. - 1587 Joseph ben Moses Miṭrani the Elder, Egypt. - 1676 Joseph ben Eliezer: Italy and Germany. - 1709 Nathan Mannheim: Germany and Poland. - 1765 Jacob al-Yashar: Persia. - 1776. Jacob Raphael Saraval: Holland and England (ib. p. 206). - 1793. Yosef Maimon: Bukhara. - 1800 Israel of Shklov: Lithuania and Belarus. - 1854 Jacob Sapir: Yemen, British India, Egypt, and Australia (Second mission). - 1870 Moses Pardo: North Africa. - 1885 Moses Rivlin: Australia. After 1850, due to both increased rate of immigration from a various countries, there were splits and there existed no fewer than twenty-five kollels (the name for geographic-based communities) in Jerusalem. Rabbi Joseph Rivlin, as secretary of the Central Committee and working under the Chief Rabbi of Jerusalem Shmuel Salant, reorganized it in 1885, introduced a modern system of bookkeeping, and issued printed reports of the receipts and expenditures of the Halukah to collectors in the communities abroad for their contributors. In America, the New York Society for the Relief of the Poor in Palestine forwarded to Rivlin about $1,250 yearly but altogether, the American contributions to the Halukah did not exceed $5,000 per annum up to 1885. 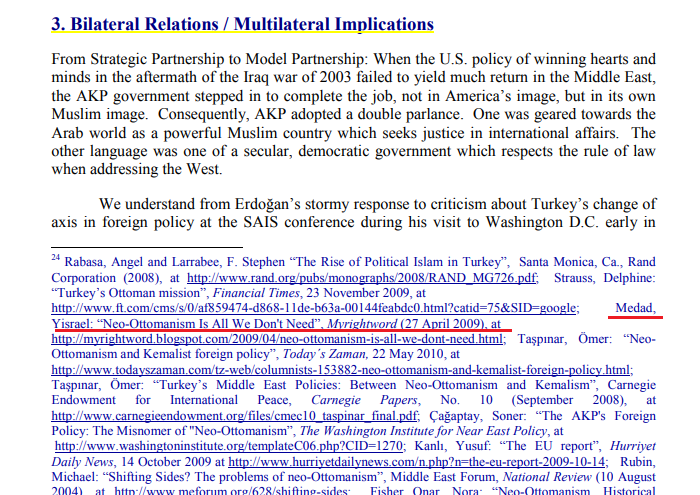 American non-Jewish involvement was also developing at that time. The Mormons believed that Jews would return to their land and Orson Hyde was sent to Jerusalem by Joseph Smith in 1841, only ten years after the founding of the Church. Hyde recited a "Zionist prayer" and dedicated the land to the Jews from atop the Mount of Olives. Official American diplomatic involvement in extending aid to the Jews of Eretz-Yisrael began with the 1830 capitulation treaty with Turkey, when the US extend on behalf of Jews there humanitarian assistance. 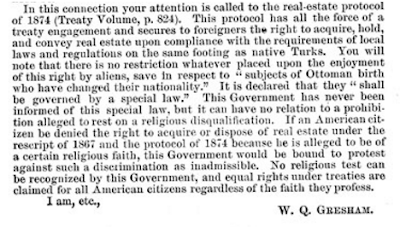 Pressure was also exerted on the Turkish authorities not to restrict Jewish immigration from Russia, following the assassination of the Alexander II in 1881. 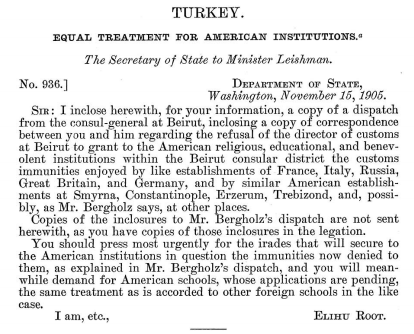 The American involvement took political shape when the American Minister to Constantinople, Oscar S. Straus, agreed with the head of Zionism, Herzl, that Palestine must receive Jewish immigrants without Turkish opposition. 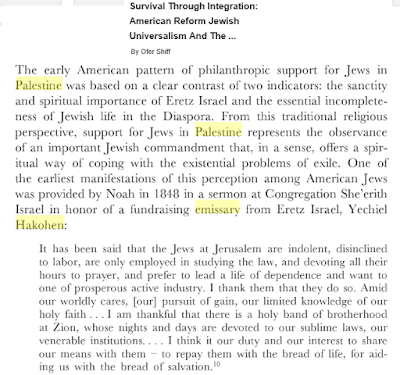 Frank E. Manuel, in his “The Realities of American–Palestine Relations" (Washington, D.C.: Public Affairs press, 1949)” provides additional information of these early periods as does David Malkiel’s “The Shadar–host economy: new perspectives on the travels of emissaries from the Holy Land”, Journal of Modern Jewish Studies, 2016. Joseph G. Wilson, the United States consul at Jerusalem, gave his approval to the establishment of Kollel America on Feb. 10, 1879, writing that "a responsible agency for the distribution of their charities may be the means of great and lasting good," and promised cooperation to the best of his power. This initiative, was met with resistance from other kollel bodies and it was only in August 1895 that, with the help of the American Consul in Southern Syria finally succeeded in organizing their kolel. 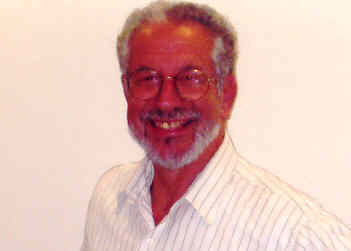 Rabbi Joshua Loeb Diskin in Jerusalem was appointed to act as the receiver of all contributions for the American kollel. The members in New York contributing to the American kollel were incorporated on December 17, 1897, as "The American Congregation, the Pride of Jerusalem”. A review of the volumes of The Foreign Relations of the United States (FRUS) series (here: https://history.state.gov/historicaldocuments/pre-truman) which presents the official documentary historical record of major U.S. foreign policy decisions and significant diplomatic activity reveals several additional instances than those discussed when official American representatives engaged in actions and decisions that promoted the ongoing Diaspora-Eretz-Yisrael relationships. Here is an overview from the General index to the published volumes of the diplomatic correspondence and foreign relations of the United States, 1861-1899 (1902). Also see: Cyrus Adler, “Jews in the DiplomaticCorrespondence of the United States”, Publications of the American Jewish Historical Society, No. 15 (1906), pp. iii, v-vii, 1-117, 119-122. 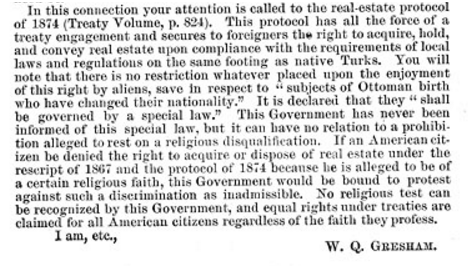 Interestingly enough, perhaps the first recorded instance of US diplomatic intervention on behalf of Americans seeking to settle in the country and purchase ‘landed property’ was in 1866 in the case of the Mount Hope group. In “God's Sacred Tongue: Hebrew and the American Imagination”, Shalom L. Goldman describes that Moshe Malkhi arrived in America already in 1759 and visited with the to-be head of Yale University Ezra Stiles in Newport. A main topic of the conversation was the question would Turkey’s Grand Sultan give a public pronouncement of permission for Jews to freely settle in Eretz-Yisrael. In her study of one of these emissaries, Lilach Torgeman ("Rabbi Nathan Amram: The ShaDaR (Emissary) of the Nineteenth-Century Hebron Community") notes that emissary “brought with him great authority, the authority of Eretz- Israel, in whose name he acted; [he] awakened the people from their spiritual and moral hibernation, issued regulations, tightened existing ones, wrote approbations, solved disputes, and made peace between communities, sects, and families”. These Rabbinical emissaries visited Jewish communities throughout the world; the Ottoman Empire, Western Europe, and North Africa were the most frequent and important destinations. For example, in 1876, as found in Avraham Yaari's monumental history of the emissaries (in Hebrew), Nathan Natkin of Jerusalem was made an emissary. In order to complete his mission, he was given a well-used communal notebook which was passed down to him by the previous emissaries who had been collectors of charity from the 1840s. The notebook contains lists and affirmations given by boards of trustees from the various communities visited in the United States from the east coast (Boston, Albany) all the way to the west coast (Los Angeles). Lists that had been signed with wax seals by the boards of trustees to prove that nothing in the books had in fact been cooked. Not only was money received for the general kitty, as it were, but for specific goals, such as buying the land adjacent to the tomb of Simeon the Just. This land is located just to the north of the American Colony Hotel in Jerusalem and actually continues to be land under dispute. He again traveled to the United States in 1885. Another example relating to an emissary who traveled to America was reported in the Havatzelet Hebrew-language journal of January 6, 1871 by its New York correspondent Aaron Yehuda Yehuda Leib Ish-Horowitz. Shlomo Attias left Jerusalem for America to collect funds but, after leaving New York, while sleeping in a hotel in Louisville, Kentucky in April 1870, a fire broke out and he was killed in the flames. A Rabbi Kleveberg collected money for the his orphans, $48 which was worth about $1750 at the time, as the mother had also passed away due to malnutrition in Jerusalem shortly after her husband died. In a follow-up report from March 31, 1871, members of the local Jewish community on the Lower East Side went to Attias' lodgings on Allen Street and, upon opening his trunk, found $446 (worth almost $8000 then). At that time by 1871, Sephardi and Ashkenazi emissaries, having found themselves in an unproductive competition for American funds, arrived at a compromise of a rather complex division/distribution system. In the 2014 book referenced above, “Emissaries from the Holy Land: The Sephardic Diaspora and the Practice of Pan-Judaism in the Eighteenth Century”, Matthias B. Lehman explores how this philanthropic network was organized in that century and how relations of trust and solidarity were built across vast geographic differences. It looks at how the emissaries and their supporters understood the relationship between the Jewish Diaspora and the Land of Israel, and it shows how cross-cultural encounters and competing claims for financial support involving Sephardic, Ashkenazi, and North African emissaries and communities contributed to the transformation of Jewish identity from 1720 to 1820. Lehman provides a critical, historical perspective on the question of how Jews in the early modern period encountered one another, how they related to Jerusalem and the land of Israel, and how the early modern period changed perceptions of Jewish unity and solidarity. Rabbi Hayim Rafael Carigal (or Karigal) was born in 1732 in Hebron where he studied and was ordained a rabbi at the age of 17. Appointed an emissary, Rabbi Carigal reached Newport, Rhode Island, in 1773 after time in New York and Philadelphia. In addition to his sojourn in Colonial America, he had spent two years in Constantinople (1754–56); two years in Curaçao, (1761–63); two and a half years in London (1768–71) and one year in Jamaica (1771–72). On July 21, 1773, he sailed for Suriname, and in 1775 he was at Barbados where he eventually died in 1777. Carrigal appears to have published two brochures of his sermons in Newport in 1773 and they are the first Jewish sermons published in the United States. Because of Carigal’s relationship with Yale’s fifth president, Reverend Ezra Stiles, in 1777 Hebrew became a required course in the freshman curriculum. At Yale’s commencement ceremony in September 1781, Stiles delivered an address in Hebrew, Aramaic and Arabic. Carigal’s portrait, commissioned by Stiles, hangs in Yale University’s library. Among the additional emissaries who reached America, we can include Shmuel Yitzhaki on behalf of Tiberias. The Shearith Israel Congregation of New York records, as Rabbi David de Sola Pool published in the Brandies Avukah Annual of 1932, p. 546, he arrived there in 1825 and before going on the Charleston, Massachusetts, he had collected $329.75 in addition to boarding funds of $60.50 and further travel expenses of $45. - 1848-1850 Yechiel Cohen, Yehosef Schwartz, Zadok Levy, Aharon Zelig. 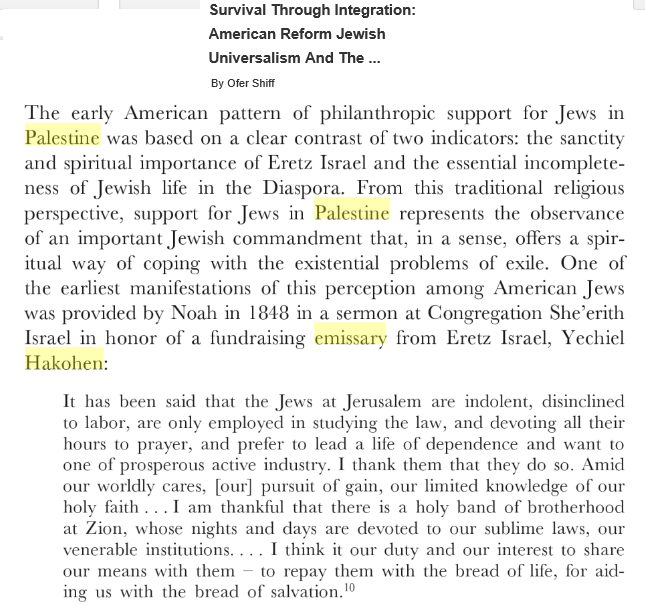 - 1860 Avraham Nissan (Weinstein) reached California and spoke at San Francisco's Sherith Israel congregation on November 21, 1861 (see: Salo Wittmayer Baron's "Palestinian messengers in America, 1849-79: [a record of four journeys]" in America and the Holy Land", 1977 as well as "Jewish Voices of the California Gold Rush: A Documentary History, 1849-1880" by Ava Fran Kahn). - 1866-67 Aryeh Leib ben Aaron Cohen, with Natan Netta Notkin, visited Utica, Rome, Oswego, Toledo, Detroit, Saint Louis and Montreal. Notkin then continued on alone from February 1868 and reached San Francisco, Sacramento, and Stockton and returning to the East Coast, was in Washington D.C., Richmond, Norfolk, Nashville, Mobile, Macon, Montgomery, Meridian, Memphis and Savannah. He returned to NY in March 1869. During - 1869 Azriel Zelig Hoisdorf who collected the considerable sum of $2000 for Jerusalem projects for the needy. - 1871 Shaul Binyamin Hacohen also served as the Rabbi for Newport. - 1876-1878, he was in America for a second mission and reached Nevada City, Grass Valley and Maysville, among other outlying places. …He then managed to obtain an interview with Secretary of State Hamilton Fish. Rabbi Schneerson pointed out that the American Consul to Jerusalem had been mixing Christian proselytizing with his diplomatic duties. Indeed, the consul had personally tried to entice a Jewish girl to convert to Christianity. Not long after his meeting with Fish, Rabbi Schneerson was invited to meet the President of the United States. As reported in Washington's The National Intelligencer, Schneerson, attired in his oriental costume, managed to attend of meeting where addressed the President was present. The Rev. S. M. Isaacs, of New York, begs to acknowledge the receipt of the following donations for the poor of the Holy Land, and takes the opportunity of stating, that in all cases where money is received for these poor pilgrims of hope, it is transmitted to the needy “of the four cities.” Sir Moses Montefiore, Bart., is the agent, through whose direction it is forwarded and distributed, and receipts from the recipients are duly sent to the donors. Note.—From the above acknowledgment it will be seen that the worthy minister of the Wooster Street Synagogue, of New York, continues to display an active zeal in behalf of the suffering Israelites of Palestine; and we hope that his appeals may be liberally answered by those having the means to alleviate the distresses of their fellow-men. But, after all, it would be much better if a proper system of agriculture could be introduced into our ancient heritage, by which means those who now lack bread might be enabled to obtain it for themselves from the bosom of the earth, which is still as fertile in many places as in olden days. We shall, therefore, be rejoiced to learn of the success of the proposed movement of Mr. Warder Cresson (Michael Boaz Israel), who is himself a thorough farmer, and is about returning to Palestine to open, if possible, an extensive farm outside of Jerusalem in the Valley of Rephaim. To succeed in this worthy attempt, to settle the country anew with a hardy, brave, and independent population, to chase away the prowling Arabs, who render everything insecure wherever they show their horrid visage, would at once strike off the shackles of poverty which now weigh down the spirit of our brothers. How glad we shall be to record in future numbers of our work the triumph of this redoubt­able convert, and we wish him and his labours in the outset a hearty “God speed.”—Ed. Oc. rarely interfered with by various host nations. To have it debated in court or even adjudicated would be wrong. Clermont-Ganneau, Charles Simon (1896). [ARP] Archaeological Researches in Palestine 1873-1874, translated from the French by J. McFarlane. 2. London: Palestine Exploration Fund. 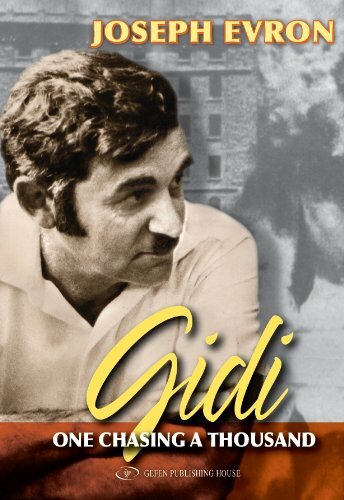 Finkelstein, Israel; Lederman, Zvi, eds. (1997). Highlands of many cultures. Tel Aviv: Institute of Archaeology of Tel Aviv University Publications Section. ISBN 965-440-007-3. Guérin, Victor (1875). Description Géographique Historique et Archéologique de la Palestine (in French). 2: Samarie, pt. 2. Paris: L'Imprimerie Nationale. Hütteroth, Wolf-Dieter; Abdulfattah, Kamal (1977). Historical Geography of Palestine, Transjordan and Southern Syria in the Late 16th Century. 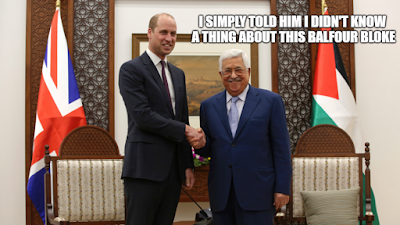 A Prince and A Tale of "Palestinian Territories"
What Has Been Found at Tel Shiloh Recently?